It is always good to have a visualisation of who is making the most sales. This isn’t to single employees out and emphasise their lacking performance, it is intended to increase their motivation to do better. Using a leaderboard is a great way to incorporate some gamification features into your sales dashboards. Gamification has been proven to be an excellent way to engage and motivate salespeople; if you want to learn more about gamification in sales, sign up here to learn more. In order for your leaderboard to work well, there needs to be some kind of reward for being at the top, otherwise your team will think it’s pointless to strive to be there. This could be a small reward, like a bottle of wine or a box of chocolates, or something even bigger if it’s in your budget. Who benefits the most from your sales leaderboard dashboard? Entire sales team and the executive team. Want to learn more about gamification? Sales and marketing are two closely tied departments. The work marketing does has a huge impact on the work that your sales team is able to do. To get a great overview, you’ll need a dashboard that provides you with a complete view of your entire funnel. You should create a dashboard that displays how your prospects are moving through your sales funnel and where the largest drop-offs are. This helps you pinpoint problems and allows you to solve them quickly. This could be displayed by showing a percentage figure of how many prospects reach the next stage of the sales funnel. With this information, you can quickly notify your marketing department if the lead quality is changing. Who benefits the most from your sales funnel dashboard? Sales management and your marketing department. 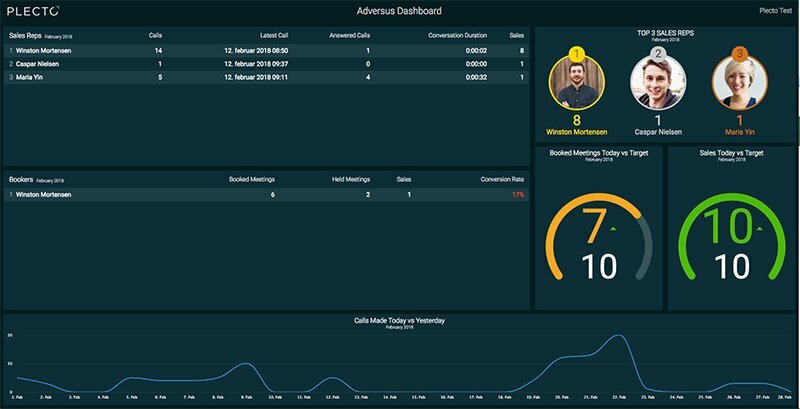 If you have a busy sales team who are constantly making sales, having a pipeline dashboard is a great way to stay organised. This kind of dashboard ensures no prospects slip through the net or get forgotten amongst the madness. Losing a great prospect due to disorganisation is something no sales representative wants – this dashboard solves this problem instantly. A sales pipeline dashboard also helps your finance department with budgeting and the like as they can see a prediction of sales that are expected to be closed within the month which allows them to make more informed accounting decisions. Who benefits the most from your sales pipeline dashboard? Sales management, the executive team, and your finance department. This is the kind of sales dashboard that ensures your salespeople are reaching their targets. On this dashboard, you display all the relevant KPIs for your sales team. It could be the number of calls or demos your salespeople have had, how many meetings they’ve booked and of course, how many sales they’ve closed. These activity metrics help keep your team on task, give you a better overview of your team and also gives you the ability to spot those salespeople who may be coasting by whilst doing the bare minimum. Who benefits the most from your sales activity dashboard? Everyone in your sales team. As a sales executive, it is important that you have quick access to a dashboard that gives you an overall picture of what’s happening in your sales team. It is also important to display your own KPIs to hold yourself accountable and keep yourself on track. The executive sales dashboard should take the most important KPIs and metrics from all the other dashboards and display them simply on one single dashboard. This could include deals won, deals lost, revenue and churn. Your executive sales dashboard enables you to make better and more informed management decisions while giving you instant access to all the answers you need. If you’re reporting to a CEO or a board, then this dashboard is the perfect way to visualise your team’s performance in an easy-to-understand way. And what does this mean? Less time spent on reporting! Who benefits the most from your executive sales dashboard? Interested in setting up some sales dashboards for your team? Try Plecto free for 14 days and see how using dashboards can make your life easier.